Necklet made from a narrow strip of hide, fastened at the top by being knotted around a short wooden twig. This has been strung with 59 beads and pendants, that have a variety of forms. Eight of these beads have been made from twigs, cut into roughly cylindrical segments and perforated either through the centre, or about one third from the end. These have been left with their surface bark intact. Another type of bead has been more carefully shaped from similar twigs into 45 cylinders with flat ends; the bark has been removed from these and the surfaces polished; they are currently a light brown colour (Pantone 7509C). These were similarly pierced through the centre; on some, the surface around the hole has been slightly carved out to form a depression, that provides a seating for the adjacent bead; these seem to be strung so as to sit at right angles to one another. In addition to these bead types, which form the bulk of the necklet, there are six unique beads arranged at various places along its length. The first of this is a large wooden circular disc with flat upper and lower surfaces and a small thread hole. These flat surfaces have been artificially blackened. Next, a narrow cylindrical bead has been carved along its length to give it a fluted profile, reminiscent of a Bongo funerary post. A small bone, possibly from a bird or rodent has been perforated near the top, and hangs down as a pendant near the centre of the base of the necklace; the end of this is broken. This is a yellowy cream colour (Pantone 7402C). This sits adjacent to a large twig bead, pierced near the top end and with a hollow underside, that hangs down as a centrepiece; this is a dark brown colour (Pantone black 4C). Further around the necklace is an oddly shaped wooden bead that seems to be carved from a naturally bent twig, with the bark removed; this has the shape of a wooden headrest and may have been deliberately chosen for the resemblance. Finally, the last notable bead is a wooden cylindrical bead which has had two grooves carved around its circumference near either end. The necklace may be complete, but the hide cord has broken and modern thread has been used to keep the various elements together. There are traces of a glossy material on the underside of the large disc bead and along two face of the large twig pendant; this may be something that has rubbed off the body of the original owner. The length of the necklace, doubled up, is around 300 mm. The twig and cylinder beads vary in dimensions; however an average example of the latter has a length of 22.5 mm and a diameter of 8 mm. The large disc bead measures 35.5 by 35 mm wide, and is 14 mm thick. The fluted bead is 25.7 mm long, with a diameter of 5 mm; the bone pendant is 34 mm long; the large twig pendant is 64.5 mm long, 14.5 mm wide and 14 mm thick, the 'headrest' bead is 45 mm long, and the grooved bead 24.5 mm long and 6.5 mm in diameter. The necklace weighs 54.2 grams. Collected by John Petherick, who led three separate trading expeditions that passed through Bongo territory between 1856 and 1858; this material was shipped back to England in 1859. See Petherick 1861, Egypt, The Sudan and Central Africa for more details. Subsequently acquired by Pitt Rivers, perhaps via auction, as Petherick is known to have sold some of his collection through Mr Bullock of High Holborn, London, on 27th June 1862 (see the Catalogue of the very interesting collection of arms and implements of war, husbandry, and the chase, and articles of costume and domestic use, procured during several expeditions up the White Nile, Bahr-il-Gazal, and among the various tribes of the country, to the cannibal Neam Nam territory on the Equator, by John Petherick, Esq., H.M. Consul, Khartoum, Soudan ). This auction contained at least 3 Bongo necklaces and an amulet. It is recorded as having been in Pitt Rivers’ collection by 1868, when it was illustrated in Wood's Natural History of Man. Pitt Rivers sent this object to Bethnal Green Museum for display, as part of the first batch of objects sent there, probably in 1874. This object was later displayed in the South Kensington Museum, and transferred from there to become part of the founding collection of the Pitt Rivers Museum in 1884. This necklace is illustrated by Wood with the comment: 'The Dor are fond of wearing amulets, though they do not seem to have any particular idea of their meaning' (J.G. Wood, 1868, The Natural History of Man, Vol. I, p. 499). This does raise the question of whether this sort of object was in fact amuletic. Accession Book IV entry [p. 166] - [insert] 1884.75 cont. [end insert] PERSONAL ORNAMENTS NUTS, SEEDS etc (cont. ) [insert] 32 [end insert] - Necklet of bits of twig (mostly barked), two carved in notches, a bit of bone and a wooden disc. DOR, C. AFRICA. Petherick coll. (1505 black). Collectors Miscellaneous XI Accession Book entry [p. 193] - PETHERICK, Consul [...] [insert] 1884.75.32 [end insert] DOR necklace of bits of twig, some carved, wooden discs & piece of bone (P.R. black 1505). [p. 197] [insert] BONGO is tribe's name for itself. They are called DOR by neighbours [end insert, by BB]. Black book entry [p. 60] - 1505. 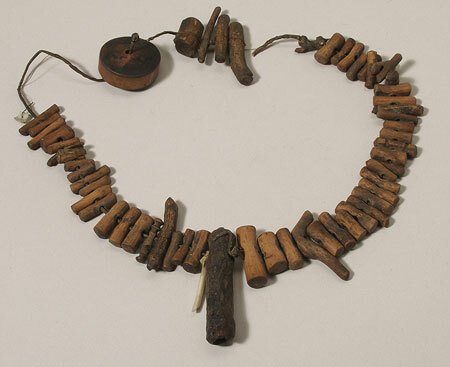 Amulet necklace, fragments of wood animals bones & wood discs. Dor Tribe. C. Africa. [insert] 1884.75.32 [end insert]. Delivery Catalogue II entry [p. 271] - Necklace, pieces of wood, Dor Tribes, 1505. Case 8, [screen?] 325. Card Catalogue Entry - The card repeats the accession book entry, but gives the collection date as 1858. As this information is not given in any of the original book entries, it may not be reliable [RTS 7/4/2004]. Old Pitt Rivers Museum label - 1505 [small rectangular piece of white paper attached with wire, still tied to object; RTS 8/6/2004]. Written on object - DOR TRIBE, CENTRAL AFRICA, PETHERICK. P.R. coll (black 1505) [RTS 8/6/2004]. This object was displayed in Bethnal Green and South Kensington Museums (V&A) [AP]. Sparks, Rachael. "Bongo necklet" Southern Sudan Project (in development). 03 Jan. 2006. Pitt Rivers Museum. <http://southernsudan.prm.ox.ac.uk/details/1884.75.32/>.